INSTANT #1 NEW YORK TIMES BESTSELLER " I've Been Thinking... ] is beautiful...I felt your soul on these pages." -Oprah Winfrey "If you are feeling stuck, lost, or you just need a pick-me-up, this is the book for you. 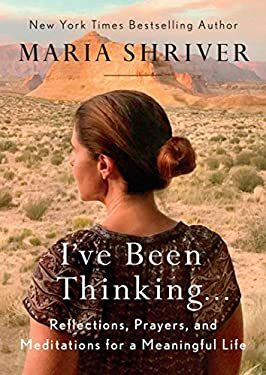 Shriver's wisdom will fill you up." --Hoda Kotb, coanchor, The Today Show A book of reflections for those seeking wisdom, guidance, encouragement, and inspiration on the road to a meaningful life--a perfect holiday gift As a prominent woman juggling many roles, Maria Shriver knows just how surprising, unpredictable, and stressful everyday life can be. In this moving and powerful book, she shares inspiring quotes, prayers, and reflections designed to get readers thinking, get them feeling, get them laughing, and help them in their journey to what she calls The Open Field--a place of acceptance, purpose, and passion--a place of joy. I've Been Thinking . . . is ideal for anyone at any point in her life. Whether you feel like you've got it all together or like it's all falling apart--whether you're taking stock of your life or simply looking to recharge, this is the book you will turn to again and again. Spend the weekend reading it cover to cover, or keep it on your nightstand to flip to the chapter you need most. Like talking with a close friend, it's the perfect daily companion--an exceptional gift for someone looking to move forward in life with hope and grace. New (524 available) BRAND NEW. Over 1.5 million happy customers. 100% money-back guarantee. Make your purchase count: support Better World Books' worldwide literacy partners.